“First Man” is the newest film by director Damien Chazelle who has directed two of my favorite films of recent years, my favorite of 2013: “Whiplash”, and of course my favorite of 2016: “La La Land”. When I heard he was directing a film about Neil Armstrong and the moon landing, I was immediately on board and then I heard Ryan Gosling was going to be apart of it and I was even more on board. “First Man” was incredible. I figured I was going to love this film before I even went in the theatre and I came out loving it even more than I thought I was going to. 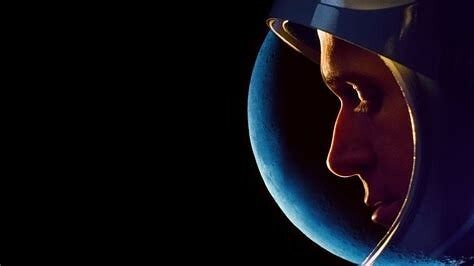 The cast was fantastic, Ryan Gosling once again shows us why he deserves to be recognized as a phenomenal actor by giving such a powerful performance as Neil Armstrong even though he does not say much during the film and Claire Foy as Janet Armstrong also gives an amazing performance, she was amazing to watch in this film. Damien Chazelle also reteams with the composer Justin Hurwitz from “Whiplash” and “La La Land” and he gives us another beautiful score here that fits this film perfectly. I really liked how this film was shot, the cinematography was gorgeous, but just the way it was shot, it had sort of a documentary esque style to it and it worked really here. Also of course the direction, Damien Chazelle’s direction is fantastic and he just once again knocks it out of the park and shows us why he is the youngest director to win an oscar. There were scenes in this film that literally took my breath away and made me grasp onto the arm rests of my seat, making me feel like I was taking these tests with these men and in this rocket with them and I was just blown away the entire time, and the IMAX experience with this film was one of the best I have had. In the end, “First Man” was everything I wanted it to be and more. Go see this film in IMAX, do not see it in anything else unless you have to, see it in IMAX. I loved everything about this film, this film has jumped up to my favorite film of the year so far, I can’t wait to see it again, and please go see this film.